The high quality Natural Sandstone from Siloam Stone is an excellent choice for Hand Stacked retaining walls. In addition to the beauty of our genuine real stone, its outstanding durability provides assurance that it will withstand the most extreme conditions. Installation of walls is always critical to the integrity and longevity of every project. Siloam Stone has a wealth of information available to assist you in your wall building project. Siloam Stone offers a variety of genuine stone in a range of natural earth tones including Sienna Buff & Sienna Grey with gold, burnt sienna, rose, brown, and rust accents. The dark weathered surface Field Stone or Moss Rock are also available for hand stack walls. 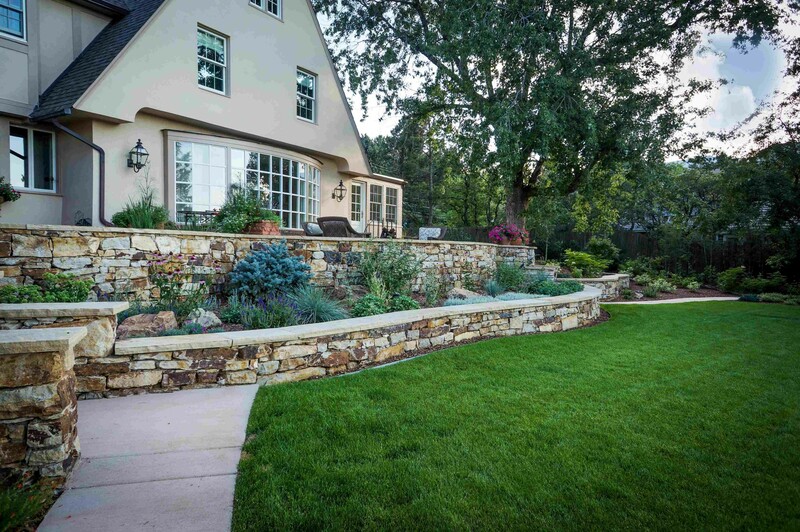 In Littleton, CO, a spectacular terraced retaining wall was hand installed using Siloam Sienna Buff wall stone. 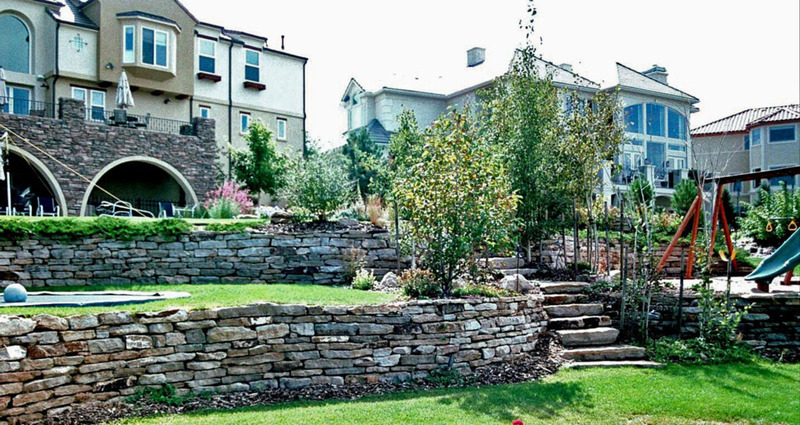 Examples of other attractive hand stack retaining walls include walls built for Grand Timber Lodge / Peak Resorts in Breckenridge, CO and residences in Colorado Springs and Pueblo West, CO.
Design and Installation: Homeowner. Hand Stack Sienna Buff planter. 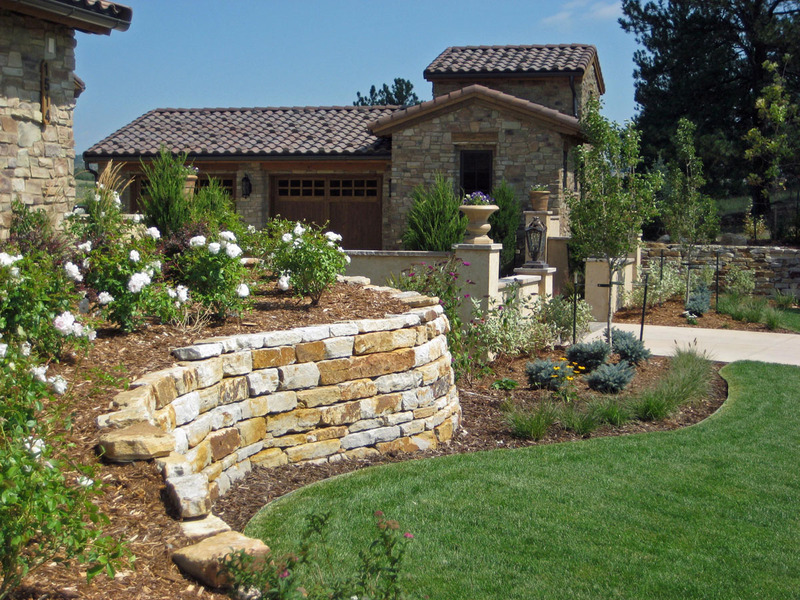 Design and Installation: Southern Colorado Landscaping. Description: 2-4” Wall Stone. Design and Installation: Fredell Enterprises, Colorado Springs, CO. Custom mortared terraced retaining walls using Wall Stone 3-5”. 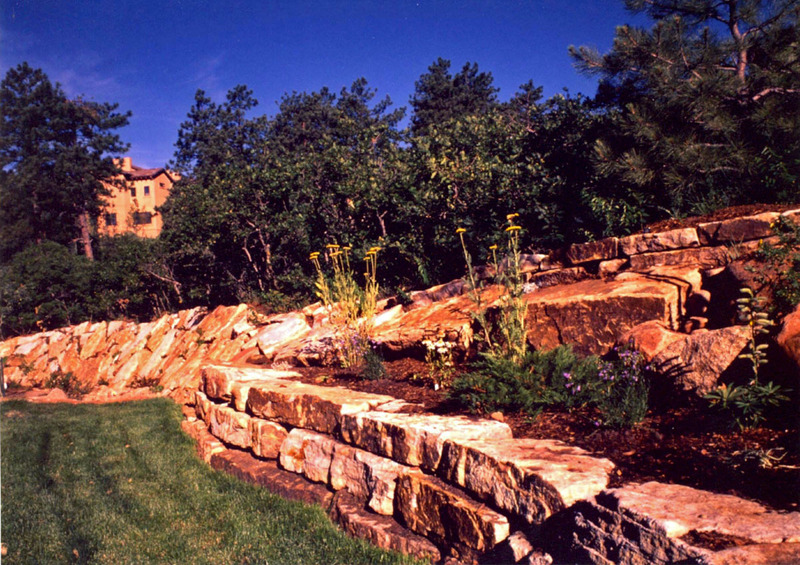 Design and Installation: Designs by Sundown, Littleton, CO Description: Terraced retaining walls - Siloam Sienna buff Wall Stone 2-4” and 3-5” (hand installed). Stair Treads- 4-6” Sienna Buff Slabs (machine installed). 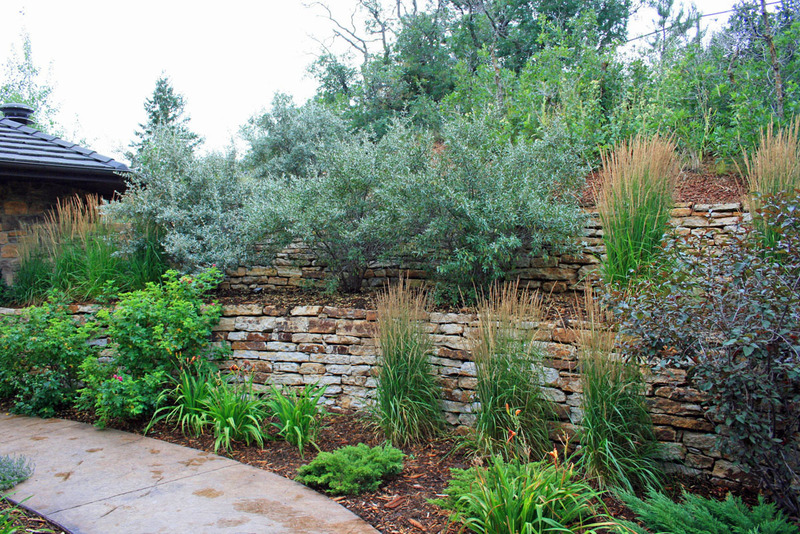 Design and Installation: Accent Landscapes, Colorado Springs, CO. Description: Bulk Wall Stone 3-7' (hand stack). 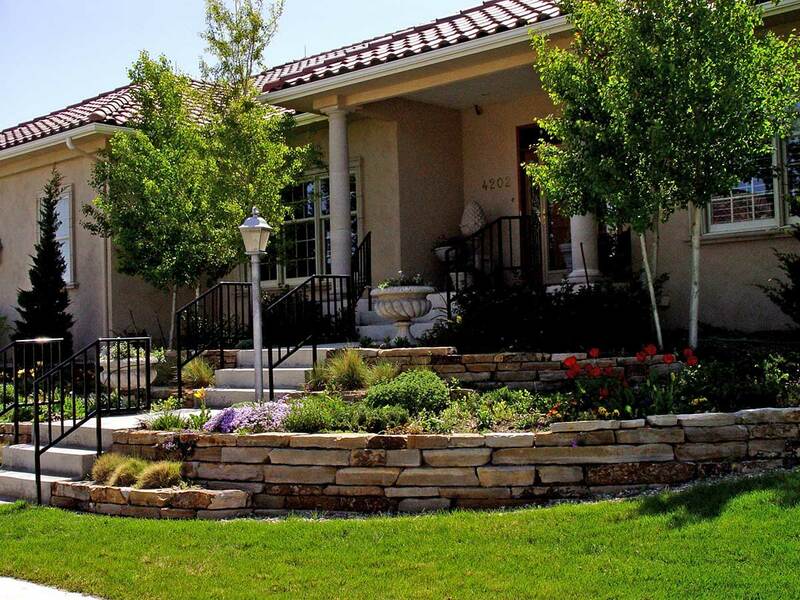 Landscape Design and Installation: Fredell Enterprises, Colorado Springs, CO. 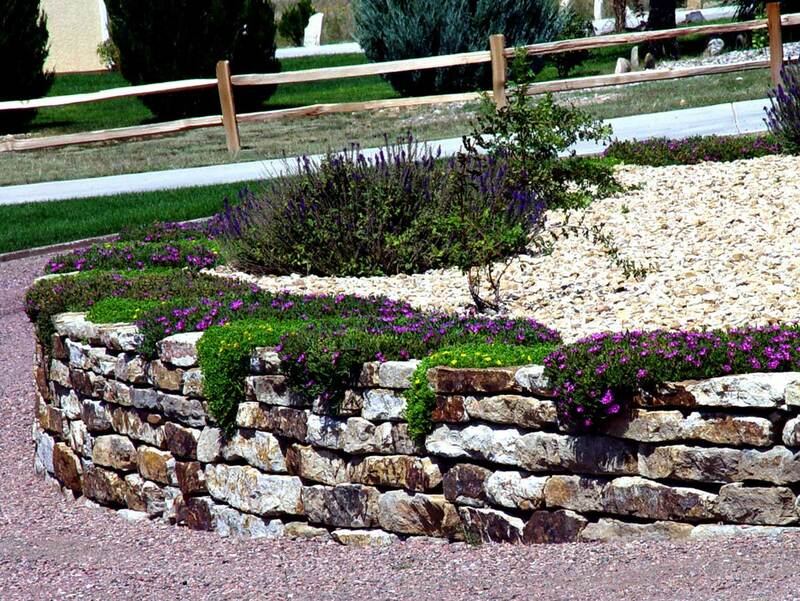 Description: Wall Stone 2-4’ and 3-5’ hand stacked retaining walls. Stratton Preserve Private Residence: Colorado Springs, CO.
Design: Matthew Stais, Architect. Landscape Installation: Green Acres of Breckenridge. Description: Hand stacked. 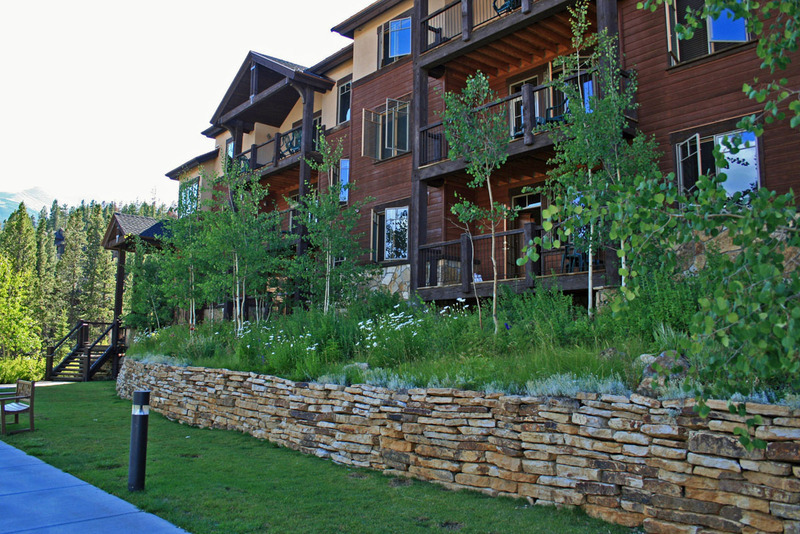 Grand Timber Lodge / Peak Resorts: Breckenridge, CO.
Design and Installation: Lucas Landscaping, Colorado Springs, CO. Description: Siloam Wall Stone stack planter in the foreground, Siloam Rip-Rap erosion slabs in the background, and Cinnamon Shadow Quarry boulder in the planter.